They save much more than their cost in nozzle cleaning. Clean nozzles = clean substrates = good paint adhesion. Maintains open nozzles for better part cleaning. Virtually eliminates nozzle cleaning; definite payback of filter. No need to realign the nozzle tips after every cleaning; saves on manpower. No concern if wrong nozzles reinstalled onto washer risers. Removable inner cartridge provides for “E-Z” cleaning. No filter bags to replace. Cartridges last approximately three to six months depending on dirt level of bath. Available in various filter micron sizes, call for recommendations. Back flush directly to waste containment or drain for “E-Z” in-line cleaning. 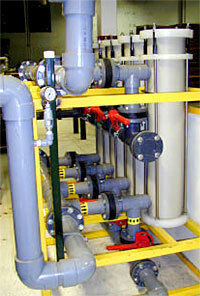 Multiple configurations to meet any GPM requirement. Each canister is plumbed with inlet/outlet valves, fresh water valve and drain valve. Optional by-pass allows for cleaning of filter cartridges without interruption to process or spray zone. Each canister contains a 34” poly-pro bag which is cleanable. - Very little can go wrong. - High tank turnover, as much as (2) times per hour. - Filter bags can be any micron size. GBF filter bags are available in two different material types, Poly-Pro or Nylon. Poly-Pro filter bags are typically acceptable for filtering most bathes regarding temperature and chemical capabilities. However, in the smaller micron sizes, Poly-Pro bags are extremely dense and can, in certain instances, cause slower filtration. In these cases, we usually recommend Nylon filter bags. Nylon bags cost about one third more than Poly-Pro bags. The life of filter bags is dependent upon the dirt content of the filtered bath and how often the bags are emptied. In cases where there is a large amount of filtered matter collected, an optional Mild Steel or Stainless Steel basket is available to support and extend the life of the filter bags. 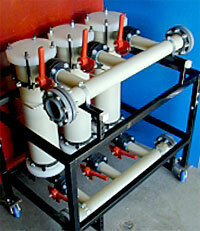 Our Gravity Fed Filter is also available in a portable model! Sludge - It’s in your tank. Clogging nozzles, causing paint rejects. How are you going to remove it? Drain your tank and pay your crew to dig it out? We have a better, more cost effective idea! 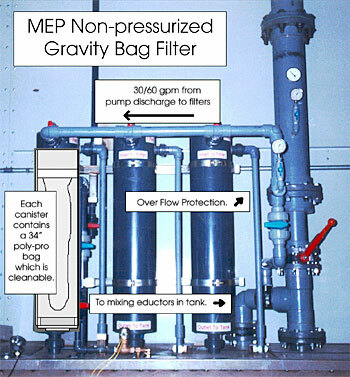 MEP's PRESSURIZED BAG FILTERS “E-Z” to install,“E-Z” to maintain. Available in PVC and CPVC or Poly-Pro. PBF filter bags are available in two different material types, Poly-Pro or Nylon. Poly-Pro filter bags are typically acceptable for most filtered bathes regarding temperature and chemical capabilities. However, in the smaller micron sizes, Poly-Pro bags are extremely dense and can, in certain instances, cause slower filtration. In these cases, we usually recommend Nylon filter bags. Nylon bags cost about one third more than Poly-Pro bags. The life of filter bags is dependent upon the dirt content of the filtered bath and how often the bags are emptied. Each canister has an inner support basket to support the filter bag. Typically, PBF systems are floor mounted.